Attendees will get a look at new geodesign technologies. Last summer, Esri president Jack Dangermond called on everyone who wants to plan a better future—including GIS professionals—to seriously consider becoming geodesigners. "My sense is this just isn't a possible thing. It's not just a probable thing. I think it's actually inevitable," Dangermond said at the Esri User Conference. 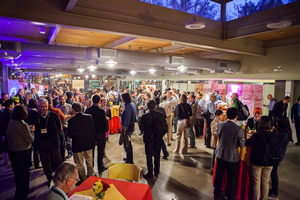 That message will be underscored when the Geodesign Summit returns to Esri headquarters in January. Geodesign evangelists will join a diverse group of professionals—architects, environmental planners, scientists, ecologists and others—interested in learning more about geodesign and the technology that supports it. The summit's theme will be Geodesign—Design for a Complex World and will include a keynote by Noel Cressie of Australia, an expert in spatial statistics and spatiotemporal statistics. The presentations and preconference workshops and training will focus on how to use geodesign as a collaborative planning and design tool and a method to find design solutions that create safe, sustainable, and more resilient communities. Esri CityEngine makes it possible to simulate entire city designs as well as measure performance against key metrics such as infiltration rates. In making an argument for geodesign and the need for more geodesigners, Dangermond cited a quote by the late management expert and scholar Peter Drucker: "The best way to predict your future is to create it." Geodesign technologies can be used to create a better future, said Dangermond, especially in the face of challenges like population growth, rapid urbanization, pollution, climate change, and drought. 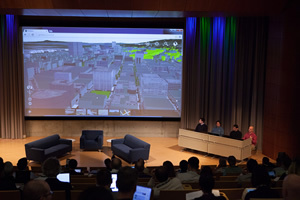 Dangermond told the audience at Geodesign Summit Europe in September that Esri has created geodesign tools to support their work including Esri CityEngine 3D modeling software for urban design, and GeoPlanner for ArcGIS, a web-based app that helps you create, edit, and share planning designs. And in ArcGIS Pro, a new application coming in ArcGIS 10.3 for Desktop, people will be able to author content in both 2D and 3D and publish it as feature, map, and analysis services; 3D Web Scenes; and web maps. "My colleagues and I are working very hard on building tools for geodesign," Dangermond said via video. "We are doing it as part of [our] GIS efforts. This is different from starting from scratch and building a geodesign platform." Many of the world's geographic information and modeling tools live within the GIS framework, Dangermond said. By introducing tools like GeoPlanner for ArcGIS and CityEngine into that platform, "it's relatively easy to teach people new things, even whole new methodologies like geodesign," he said. 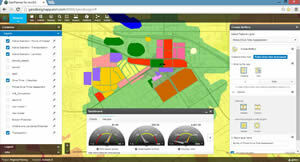 GeoPlanner for ArcGIS helps to manage the planning process more efficiently by applying the principles of geodesign. "My own philosophy is that geodesign isn't simply for the 'design' community, although they are now starting to capture the essence of it and use it," said Dangermond. "It's also for agricultural planners, foresters, water resource planners, and the military and national security. So by putting it into the basic platform, what it means is we can take the concepts you are working on to scale." Dangermond encourages robust intellectual exchanges about methodologies and technologies at events such as the Geodesign Summit and Geodesign Summit Europe. "It's only from sharing these kinds of emerging technologies that we learn from each other as a community and make advancements," he said. Since its inaugural event in 2010, the Geodesign Summit has attracted talented GIS and design thinkers and practitioners from academia, the private sector, government and nongovernmental organizations, and many industries. "This year's presenters will share some amazing insights, practices, and tools. We are still lining up speakers, and there will be a few surprises," said Shannon McElvaney, global industry manager for Community Development at Esri. Cressie, the keynote, is a distinguished professor at the National Institute for Applied Statistics Research Australia (NIASRA), University of Wollongong in Sydney, Australia. He is the foremost expert on uncertainty, a perfect topic for a keynote at an event dealing with design for complex world. "When I read A Framework for Geodesign, I had an 'a ha' moment," said Cressie, referring to a book on design methodology written by Harvard University's Carl Steinitz. Cressie will share his thoughts on how to weave state-of-the-art analyses into that framework to support defensible decision making. "In the case of this wizard, you will want to pay attention to the man behind the curtain," McElvaney said. A graduate of Princeton University with a PhD in statistics, Cressie wrote the 1991 classic reference book Statistics for Spatial Data. He and Christopher K. Wikle coauthored Statistics for Spatio-Temporal Data, winning the prestigious DeGroot Prize from the International Society for Bayesian Analysis. 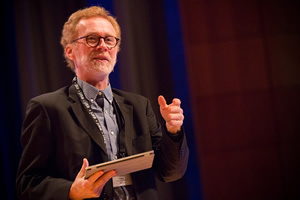 Stephen M. Ervin, assistant dean for Information Technology at the Harvard University Graduate School of Design and a lecturer in the Department of Landscape Architecture. During the 2012 Geodesign Summit, he gave a thought-provoking presentation about the possibilities, probabilities, certainties, and wild cards about the future of geodesign. Next month, he will talk about a research agenda for geodesign that should be both provocative and useful for those starting geodesign programs of their own. Zach Ferdaña, the lead coastal resilience manager of The Nature Conservancy (TNC). In his positon, Ferdaña supports ecosystem-based management, climate adaption, and marine spatial planning. He spearheads the Coastal Resilience program, which uses online decision support tools to help mitigate hazards, restore coastlines, and conduct resilience planning. Read the ArcWatch story "Preparing Coastal Areas for the Coming Storms" to learn about TNC's suite of online mapping decision support tools, powered by the Esri platform. Joseph Minicozzi, principal of the consulting firm Urban3. He will discuss how cities are using geodesign methodologies to analyze economic patterns and revenues and grow healthy financially while minimizing impacts on the environment. Carl Steinitz, the Alexander and Victoria Wiley Professor of Landscape Architecture and Planning, Emeritus, at Harvard University of School of Design. He wrote A Framework for Geodesign, published in 2012 by Esri Press. Thomas Fisher, professor and dean of the college of Design at the University of Minnesota, will be the event's emcee and moderator. Mark Reiner, a senior research scientist at the University of Minnesota's Humphrey School of Public Affairs and owner of Non Sequitur, an engineering consulting firm. He is currently working on a low-cost, low-carbon infrastructure planning project in Rajkot, India. David Rouse, a certified planner and registered landscape architect who is currently research director for the American Planning Association (APA). He will speak about how geodesign and comprehensive planning can be integrated to make communities more sustainable. David Early, principal at PlaceWorks. He will discuss how the design firm has used GeoPlanner for ArcGIS to tackle planning challenges faced by communities in California. Kelleann Foster, director of the Stukeman School of Architecture and Landscape Architecture at Pennsylvania State University (Penn State). She will talk about the success of Penn State's Massive Open Online Course (MOOC) on geodesign, held over five weeks last fall. The MOOC drew more than 10,000 people from 168 nations. Foster also attended Geodesign Summit Europe, where she spoke about the MOOC in geodesign. "What struck me was the huge number of professionals that registered for the course, a good sign that geodesign thinking is successfully entering the commercial market," said McElvaney. McElvaney said educators are becoming enthused about geodesign. As an example, he cited Christine Siddoway, a professor at the Department of Geology at Colorado College in Colorado Springs, who developed an Introduction to Geodesign course right after attending the 2014 Geodesign Summit. 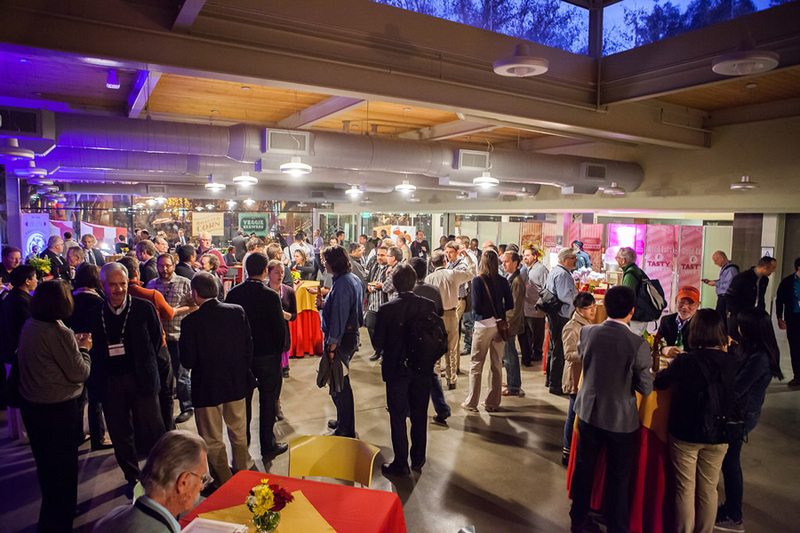 Time will be set aside to share ideas about geodesign and socialize. This new course is strengthened by local community partners such as Pikes Peak Community Foundation and Colorado Department of Parks, Recreation and Urban Services, according to McElvaney. "The project-based approach increases student learning while helping the surrounding communities plan a more resilient future," said McElvaney. "In the wake of (Colorado's ) 2012 Waldo Canyon fire and 2013 floods, I can't think of a better place more in need of an integrative, holistic planning approach than the Pikes Peak Region. "I can't wait to see what the students do with the geodesign technologies, processes, and tools they will have at their disposal." Geodesign is about "One Community" thinking, according to McElvaney. "A building is no longer a building but a part of a neighborhood, city, region, nation, even the globe," he said. "This type of integrative thinking and awareness of the cumulative impact of our collective actions is the new wave, the way we should work, and that is what you will get at the Geodesign Summit."